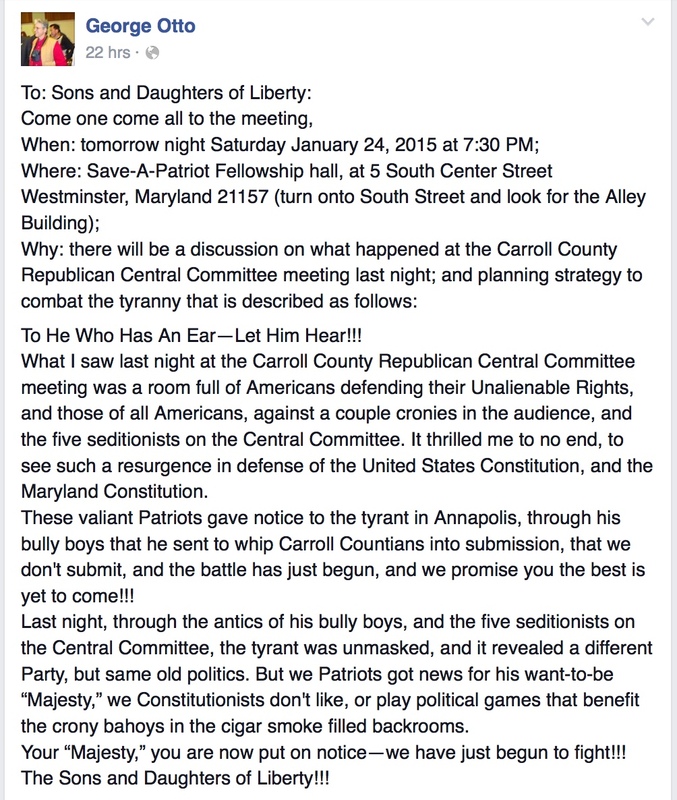 The Carroll County Republican Central Committee (CCRCC) is really doing its best to stay in the news. The CCRCC originally recommending voter-rejected, far-right Robin Frazier for the Senate vacancy caused by Sen. Joe Getty’s move to the administration. Under heavy pressure from the Hogan administration, who for some reason didn’t want to make every Democratic political operative feel like Christmas came early, the CCRCC acceded to his request to submit three names, including Del. Justin Ready, who Hogan then promptly appointed. During a special meeting of the central committee Thursday, [Amy] Gilford introduced a motion to recommend just one name, which was seconded by [Kathy] Fuller. Their argument is the Carroll committee is the only such committee in the state that has complied with the governor’s request for multiple names. Washington, Frederick and Anne Arundel counties have thus far denied the governor’s request, Fuller said. The motion did not carry, going down in a 5-4 vote. Karen Leatherwood, a member of the central committee, then introduced a motion to submit three names, which was amended to include the provision that if six of the members selected the same applicant as their first choice, the committee would submit that one name only. The motion passed by a vote of 5-4. Fuller and Gilford said they will continue to participate in the process but are doing so “under duress.” Jim Reter, member of the central committee, said the second motion constitutes an illegal process. My guess is that the CCRCC members who really want to see Robin Frazier in the legislature don’t have six votes, which should make Gov. Larry Hogan sleep a whole lot easier. Catering to the Republican Tea Party activists who support Frazier is a sure and steady path to making his term both unsuccessful and his last. Ready in for Senate, Frazier to House? The Carroll County Republican Central Committee recommended former County Commissioner Robin Bartlett Frazier, Del. Justin Ready, R-District 5, and David Wallace for the now-vacant Senate seat in District 5. Wallace was an unsuccessful candidate for the U.S. House against Chris Van Hollen and has run for other public offices in the past. So other than Del. Justin Ready, recently easily reelected by the voters, the CCRCC confirmed its penchant for selecting political losers, hardly a necessity in a county filled with Republicans who have actually won office. Once again, the process was completely secret, likely to protect the innocent from having to watch how the CCRCC makes decisions. To no one’s surprise, Hogan appointed his preferred choice: Justin Ready. He has now been appointed and sworn into the Senate, much to the relief of all concerned. Many were adamantly opposed to the CCRCC’s original sole nomination of loopy Robin Frazier, who lost reelection to her county commission seat in the primary and the general–so don’t blame Carroll voters. But is Robin Frazier Still in the Mix for Delegate? Justin Ready’s move to the Senate now leaves open his House seat. And by now you can probably guess what benighted group of Addams Family values Republicans gets to nominate his replacement: the CCRCC. Rumors are circulating around State Circle that Gov. Larry Hogan agreed to appoint Robin Frazier to the House of Delegates in exchange for getting his choice of Ready for the Senate. If so, this is a true Faustian bargain, as Frazier will be the gift that keeps on giving to Democrats every time she opens her mouth. And she has no love lost for the Hogan administration after they torpedoed her Senate appointment, so her crazy fire would go off in all directions. I look forward to the founding of her YouTube channel. Moreover, such an appointment would show incredible weakness on the part of Hogan. Less than a month after his inauguration, the Republican who carried his party to victory in deep blue Maryland would show he can’t even get his own party, let along the Democratic General Assembly, to go along with him. 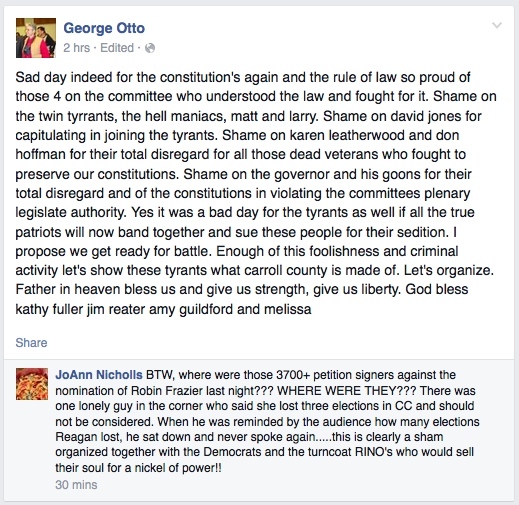 Hogan has aspirations to build the Maryland GOP. If Robin Frazier is the answer, what was the question? Let’s hope that the rumor mill is, once again, wrong. Johnny Tremain is Calling. Will You Answer? 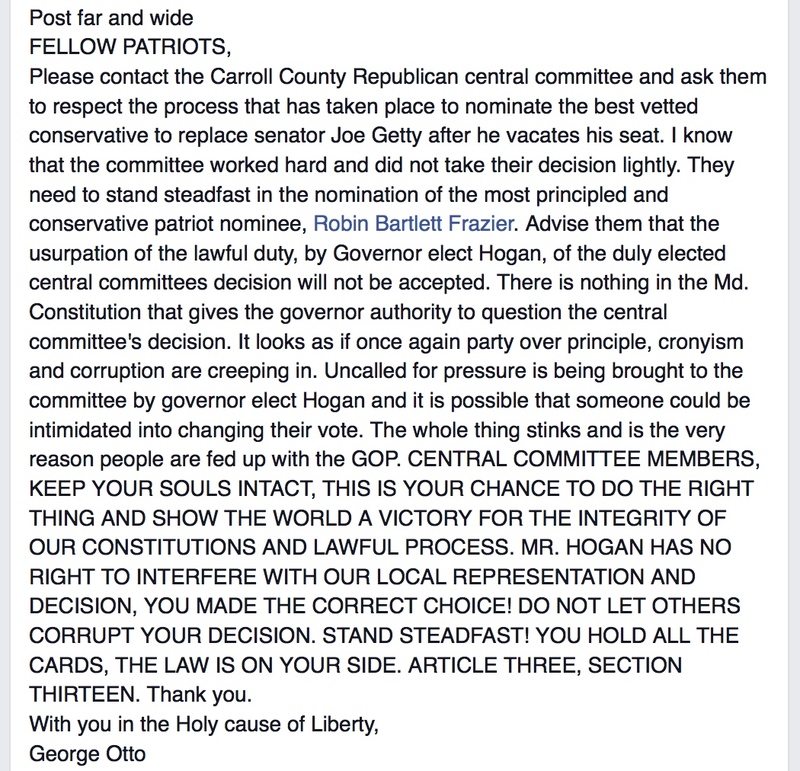 The Baltimore Sun reports that a majority of the Carroll County Republican Central Committee (CCRCC) has now grudgingly agreed to appoint additional names beyond the ever controversial Robin Frazier’s for the vacancy created by Sen. Joe Getty’s planned move to the Hogan administration once Getty resigns from the Senate. Members of the Carroll County Republican Central Committee voted 5-4 Thursday to submit three names for their second open state legislative seat at the request of officials from Gov. Larry Hogan’s administration. They did not, however, reconsider former County Commissioner Robin Bartlett Frazier’s nomination for Sen. Joe Getty’s seat. The governor’s office said this afternoon that Getty had decided to stay in the Senate for a while longer to finish some initiatives. Senate Minority Leader J.B. Jennings of Baltimore County said he still expects Getty to join the administration but knows he still has some local bills pending that he’s very interested in. Wow. Just two days into his administration, Larry Hogan has already been declared a tyrant. And people are seeing Democratic plots in the heart of the new Republican administration. This is a textbook case of how to lose friends and influence over people. Carroll County Republicans have managed to keep their senator out of the heart of a new Republican administration in order to push for the nomination of walking embarrassment Robin Frazier to replace him while undoubtedly teeing off the new governor who they overwhelmingly supported and created a public spectacle. Sen. Joe Getty (R-Carroll) is slated to take up a new position in the Hogan administration. However, a quick call to the Senate President’s office revealed that while Sen. Chris Shank (R-Washington), another Hogan appointee, stepped down with Hogan’s inauguration, Getty has not. Getty’s continuance in office is likely not because he is especially slow off the dime or wants to hold on to his senate seat as long as possible but because of the kerfuffle surrounding the Carroll County Republican Central Committee’s (CCRC) strange decision to nominate walking political disaster Robin Frazier to the vacancy. Democrats salivate at the thought of a Frazier appointment. She is guaranteed to generate endless bad press for the GOP. Needless to say, Hogan is less than thrilled. As Len Lazarick reported, he has demanded that the CCRC send up three names to him (read: someone other than Robin Frazier) in what I imagine is the desire to avoid tying his party or sharing the media cycle with this millstone. However, the CCRC website continues to announce Robin Frazier’s nomination. Can Hogan get the CCRC to change its mind? That hasn’t occurred so far and neither has Getty’s resignation. However, Facebook reports that the CCRC is going to meet tonight. Should be quite a show.